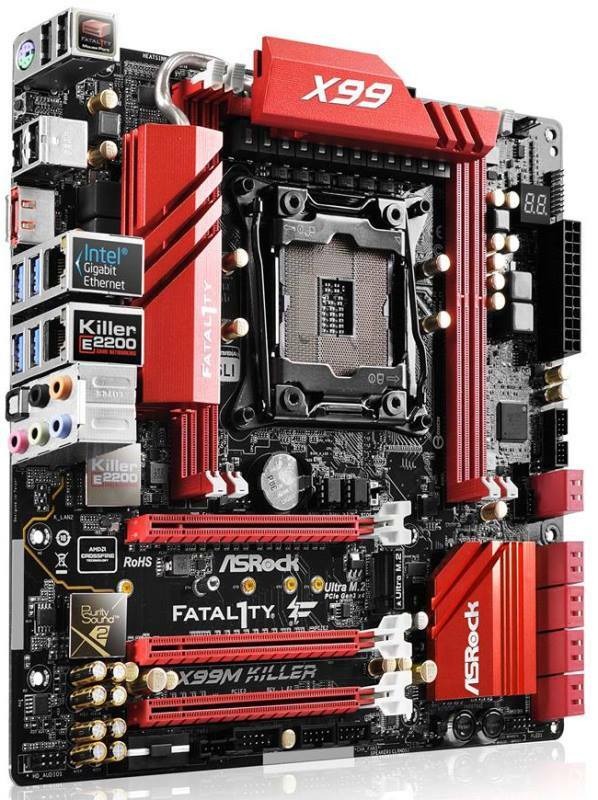 Micro ATX motherboard are not very common in High End Desktop Platforms, and while many are waiting for Asus to reveal the Rampage V Gene, ASRock has recently revealed one of their upcoming x99 motherboard – the ASRock Fatal1ty X99M Killer micro-ATX. The X99M Killer is the micro-ATX version of the Fatal1ty X99X Killer which the company also revealed several days ago. It’s built with the same features like its bigger brother, but there are also some features that were removed to fit the components in one smaller form factor. Check out some of its features and specifications below. 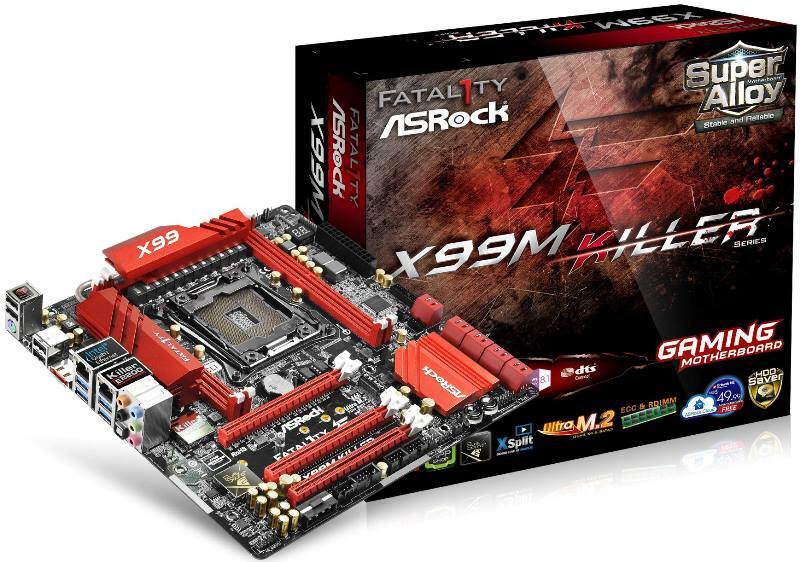 The ASRock Fatal1ty X99M Killer looks like it came with features that are also found in the X99X version. It shares the same Black-Red color theme and a somewhat similar heatsink design. But the X99 micro ATX version only comes with 4x DDR4 DIMM slots, just like what we saw in micro ATX X79 motherboards before. Like its bigger brother, the X99M Killer supports the upcoming Intel Haswell-E processors and features a new LGA 2011-3 socket. It also features a 12 Phase power design and Super Alloy components and it draws its power from an 8-pin power connector. On the upper portion, we can see a debug LED, some fan headers, two BIOS chips, a USB 3.0 headers, and some Nichicon 12K Platinum Capacitors. On the rear I/O panel of the ASRock Fatal1ty X99M Killer we can see two Fatal1ty USB ports, a PS/2 combo, a clear CMOS switch (I think), an eSATA port, two USB 2.0 ports, 4x USB 3.0 ports, 1x Intel Gigabit LAN port, 1x Killer E2200 LAN port, and some audio ports. It also features the Purity Sound 2 audio core with Nichicon Fine Gold Audio capacitors and a LED path that separates the audio components from the rest of the motherboard. The ASRock X99M Killer has 3x PCIE x16 slots and an angled 4 pin molex connector that will provide additional power for multiple graphics card configuration. It also features an Ultra M.2 PCIE Gen3 x4 slot for NGFF SSD, which is basically faster than your typical M.2 slot. There is also an onboard reset and power button just below the X99 chipset heatsink. As for storage, the ASRock Fatal1ty X99M Killer features 10x SATA III 6Gbps ports and no SATA Express port. ASRock didn’t reveal the manufacturer’s suggested retail price of the X99M Killer yet. But expect that it will be all disclosed once it is officially revealed by August 29 or onwards.